When a devotee told Baba, "I heard that your Kerala tour was most pleasant and wonderful. I am sad that I was not destined to join," Baba replied, "Have the confidence and hope that when next such an opportunity arises, you may be able to join. Meanwhile, listen to the account given by those who joined, and be happy." 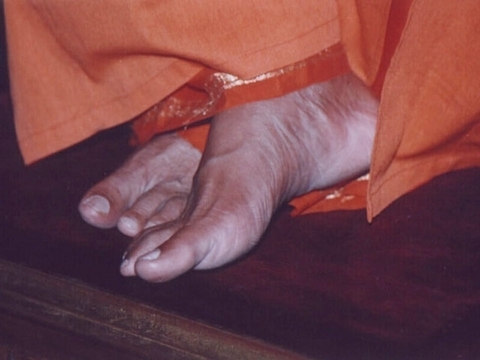 At the very moment one could discern a stately wave a few yards away, advancing majestically towards the shore and, soon it swept Baba's Feet and receded. Imagine the wonder and amazement of every one when they found, round Baba's Feet a bewitching pearl garland, swaying and swinging with every surge of the waters around Them! One hundred and eight translucent pearls each a priceless gem, strung on a thread of gold! O, how charming Baba looked! The Avathar of the Lord receiving the homage of Varuna again!